They say never to judge a book by it’s cover, and to not always rely on your first impressions. Although it’s not clear at this stage who “they” are, or who “they” refer to in these matters, “they” do have a point. When looking at the back of the box of the gam being reviewed today, it is easy to write it off as another Super Mario clone. It’s not hard to see why game companies in the late 80’s and early 90’s would copy the tried and tested formula of Mario, the whole franchise of Mario games on the NES were popular, had colourful graphics and the gameplay was second to none. 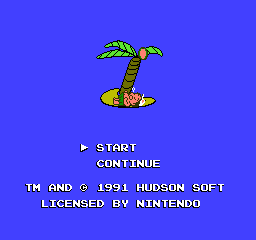 However, although it shares similarities with said Mario games, Adventure Island is not a game to easily be written off as a Mario 3 clone. Let’s take a look and see why it’s Adventure Island more than Celebrity Love Island (that was a bad reference – click here for info). 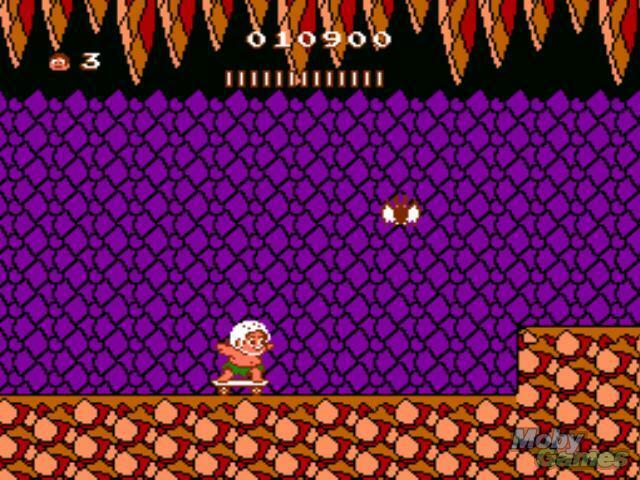 Adventure Island II was released in Europe in 1992, and is a side-scrolling platform game that resembles, erm, Mario 3. 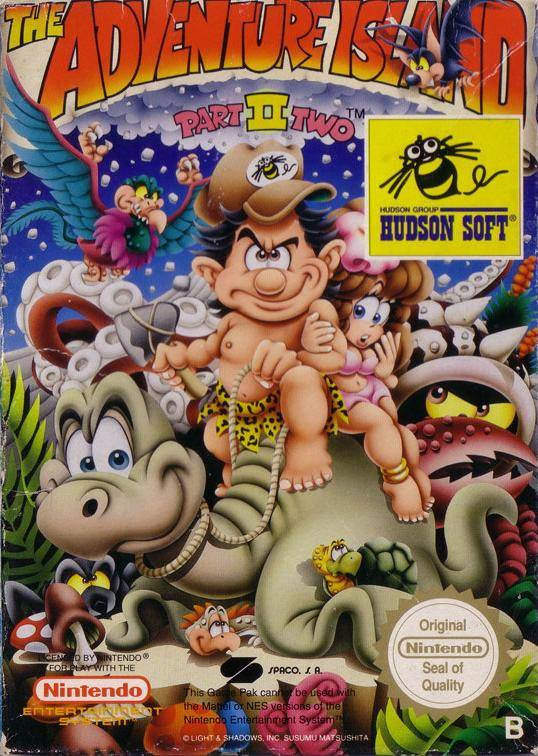 It was released by Hudson Soft who also developed titles such as Milon’s Secret Castle, but thankfully, is not as secret as being set on a castle. You control Master Higgins, who embarks on saving his favourite lady’s sister from the evil clutches of the Evil Witch Doctor and it’s persistent followers. Like a lot of titles on the NES at the time, when you pop the cartridge in your console, you have the option to start the game, or continue from where you left off. It is not a password based system however which is a shame, instead it is a game in which when you die, you can press continue to pick up from the stage you were at. So you arrive on the different island’s on your raft and away you go. The idea like all side-scrolling platform games is to get from one side of the stage to the other, defeating nightmare-inducing monsters such as snails and birds and collecting not coins a la Mario but fruit. It is nice for kids playing the game not to worship currency but to worship fruit instead which gives you points. Before the level starts, you can choose to bring any weapons or animal friends you find along the way – this could be in the form of a purple mini-dinosaur that in no way resembles Barney or other creatures. I guess Mario had Yoshi but that was later in the franchise so to use animals as a companion to attack enemies is a nice touch. If you do die, you have to start at the beginning of the level, which differs from Adventure Island I where there were checkpoints in the level so you started from there when you died. 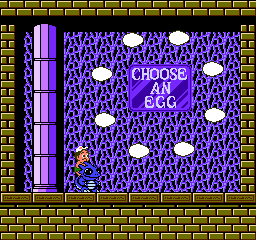 At the end of the stage as a bonus you can choose from a set of spinning eggs, choose one for a points bonus. And what do points make? Never mind don’t answer that. The controls are firm and responsive, in essence the type of controls you would want with a side-scrolling platform game. Certainly not like the stiffness of Ice Climbers. The d-pad moves the character, the A button jumps and the B-button fires your weapon should you have collected one at this point, or to make the animal you ride on fire his weapon. I say weapon like it is a dangerous projectile, but it is in fact a tomahawk-type hammer object. It does the trick however, with the majority of the puny enemies taking one hit to kill. This is good as at times you travel on a skateboard that hurtles you through the level, the last thing you want is to hammer the B button to ensure the enemy is out of your way as you do your impression of Tony Hawk. The one disadvantage of killing enemies with one hit is that they can kill you with one hit too. The music is upbeat and jolly and suits the style of the game, and it’s lush tropical surroundings. The sound effects are crisp and there is a sound effect for everything you do which matches the style well, from the simplest things such as jumping to collecting fruit. So, in that respect, turn the volume up when playing the game and leave your cassette deck empty full of the joys of Now 5 or the like. As the Righteous Brothers once sang, “Time can do so much”. Between the last review of The Simpsons (which can be found here) and now, a lot has happened so apologies for the lack of reviews, however there will be more regular reviews, as well time was needed to wash the horrors away from The Simpsons. But in that time between the last review and now, Nintendo have launched a curious title entitled NES Remix. Put simply, a number of NES games have been updated slightly in order to complete certain challenges for achievements, well more stamps than anything else. 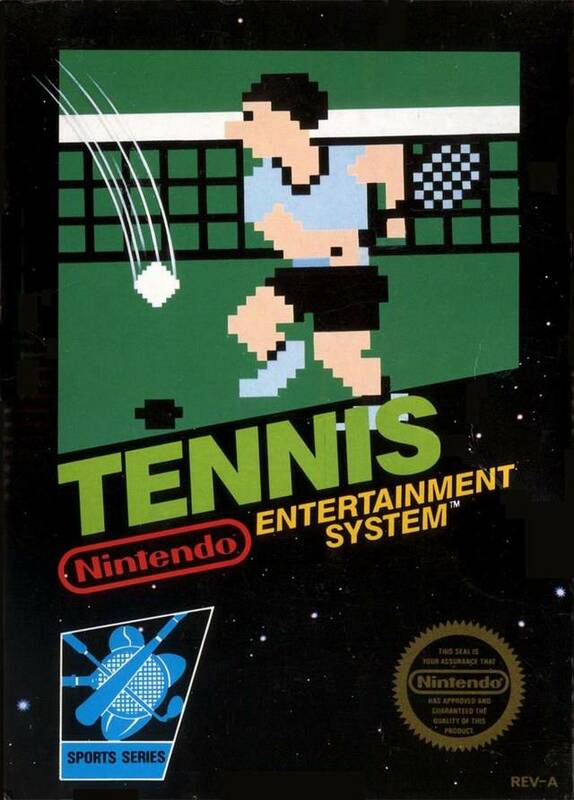 One of the games where challenges have to be completed is Tennis, which was launched on the NES console as a black box launch title in Europe in 1986. 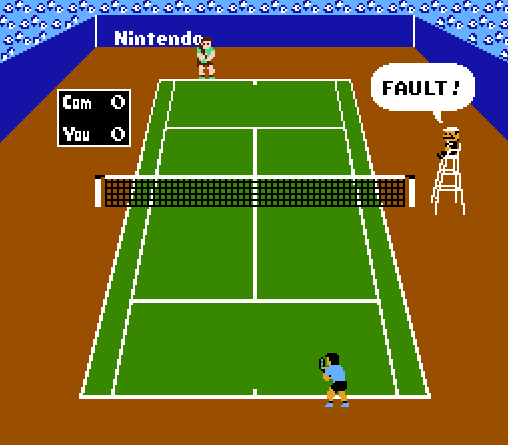 So how does the original game stack up, is it grandslam-worthy or does it contain more double faults than you could shake an amateur boys match against? 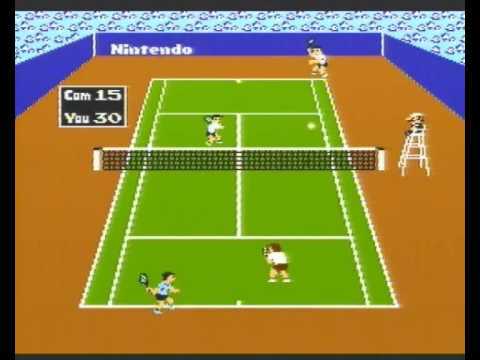 Tennis is a game that can’t go wrong in describing exactly what it is – it was Nintendo’s first foray into the world of Tennis and as mentioned was launched as a black box title in 1986 in Europe. If you don’t know what Tennis is or how to play it, then chances are you may stop reading this so click at the top to see other reviews on the site. When you pop the cartridge into your console, you’re treated to the same jaunty music on the introduction screen that befell other sports games that was released on the black box labels. You then get to choose between playing a Singles game or Doubles game, the level of difficulty and then you go straight to the game – no character no selection, no entering your name, no choosing what type of surface you want to play on – straight to the action. You really can’t fault games that don’t mess around with options and selections – two presses of the start button and away you go. So you’re dressed in duck egg blue and black shorts whilst your opponent is in a green that matches the court and can camouflage well whilst (supposedly) Mario is sitting on his high chair umpiring proceedings. Back with the launch titles, Mario sure did have a lot of jobs – a demolitions expert, a tennis umpire, a platforming superstar. When did he get time to get on with his job of going under peoples’ sinks and repairing leaky pipes or reaching around a U-bend unclogging the toilet? Well nevertheless he sits there keeping score and shouting “Out” every now and then. The rest of the graphics are simple yet bold – the standard green grass of the court and the contrasting brown around the edge of the court. Ok, there is no definition in the crowd but even now 27 years later the detail in the crowd has not improved that much! The controls are simple – the d-pad moves your character around somehow at the speed of light with twinkletoes on his feet where us mere mortals have feet. The A button does a typical forehand/backhand shot whilst the B button does a lob. The one flaw in the control system is that you cannot aim the ball properly when making your shot – if you try pushing the d pad in the direction and pressing the A or B button to make your shot, your character flies away from the ball swinging wildly and missing the ball, conceding a point. In that respect, when you hit the ball, all you can do is just hit the ball and hope it stays on court. The music, well aside from the jaunty piece at the start of the game, there is a distinct lack of this in the game. However, it always feels wrong to have music in sports games so there is no great loss in this, and certainly you wouldn’t need your Minidisc player full of college rock whilst pretending your Boris Becker. No faults with this game!